Kon-Tiki – The Movie – Premieres on August 24th! 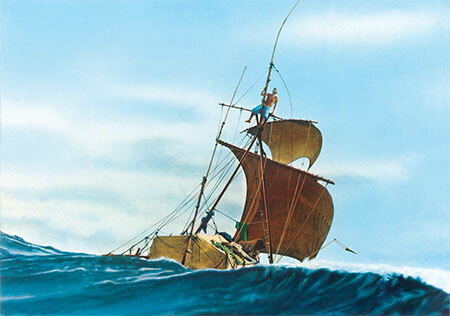 Home › Culture › Kon-Tiki – The Movie – Premieres on August 24th! In 1947, a whole world became fascinated by the young Norwegian Thor Heyerdahl. He had developed a revolutionary theory that Polynesia was populated by South Americans which was contrary to the established scientific theory of migration from Asia. To prove his theory Heyerdahl did something extraordinary: He decided to test his theory in practice – and embarked on an adventurous (and also very dangerous) expedition across the Pacific Ocean, nearly 5000 miles. He named the primitive balsa raft Kon-Tiki – after the Inca Sun God. Heyerdahl brought five young men on the expedition. None of them knew each other from before and only one of them knew how to sail. Although he himself was afraid of water and could not swim, Thor was willing to sacrifice everything and everyone to prove his theory. The film Kon-Tiki is a dramatization of actual events. It tells a story about an adventure, to dare to stand up for what you believe in and just do it even though everyone says it is impossible. 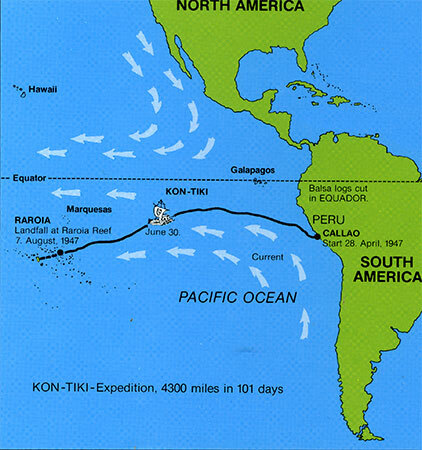 It is an epic journey that would change the lives of the Kon-Tiki crew. The book about Kon-Tiki (1948) has been translated into 70 languages ​​and it is estimated that it has sold over 50 million copies. 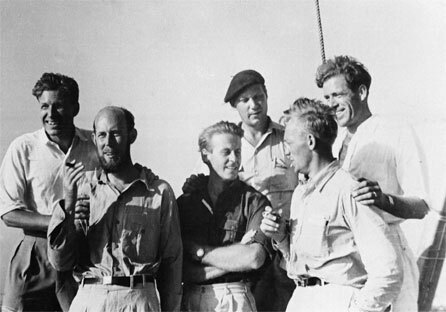 In 1951, the documentary film about the expedition received an Academy Award for Best Documentary Feature and Thor Heyerdahl himself became the most famous Norwegian in modern times. The Norwegian film premieres on August 24th. The Norwegian ethnographer and zoologist’s adventurous journey in a simple balsa raft has already received great reviews. Thor Heyerdahl and his crew brought a video camera on the original expedition which creates the basis for the feature film. Pål Sverre Valheim Hagen plays the role of Thor Heyerdahl along with Anders Baasmo Christiansen as Heyerdahl’s second in command Herman Watzinger, Jakob Oftebro as the radio telegraphist Torstein Raaby, Tobias Santelmann as the radio expert Knut Haugland, Odd-Magnus Williamson as Thor’s childhood friend Erik Hesselberg and Gustaf Skarsgård in the role of the Swedish ethnographer Bengt Danielsson. Kon-Tiki is added to the 2012 Toronto Film Festival and will be shown in the ‘Special Presentation’ section which is reserved for major films with a wide audience potential. The original Kon-Tiki raft is on display at the Kon-Tiki Museum in Oslo.